anvilfire NEWS Vol. 31 September 30, 2003, p.7 : SOFA Quad State Event, Troy, OH September 2003. The hole through chain makers anvils were for holding a bar with a support or inside swage for dressing large chain links. The far end of the bar supported an arm that was used like an Oliver to dress the top of the link. Sometimes these were struck with a sledge but up to about 3" links the swage was operated by foot power. 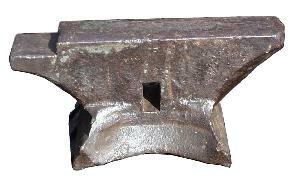 This odd little anvil has a hole like a chain makers anvil but it has an unusual step. Notice the molding detail on the feet. 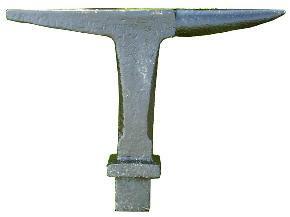 The legs on this rather ugly bridge anvil fit into dovetails so that it could be broken down. 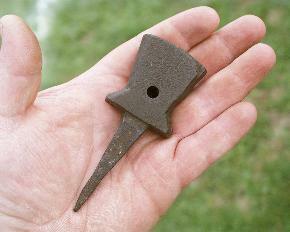 These little "pocket" anvils were used to sharpen scythes that were used to harvest grain and cut grasses. 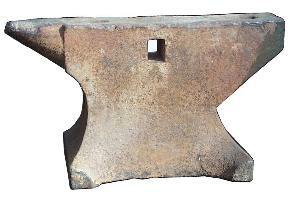 The hole is so that the anvil can be tied to a laynard to keep from losing it. It was probably attached to a small hammer handle to keep the two together. The spike is for driving into the nearest convienient tree root, log or stump. To sharpen the scythe the edge was gently hammered on to stretch and thin the edge of the metal. 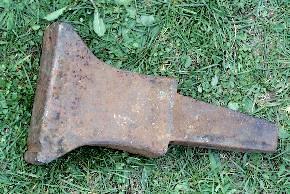 Stake anvils were used for many years before anvils had horns. They are still very handy for small work and any work that needs a slender horn. They came in many weights and proportions ranging from general forging weight to have light thin horns like a needle case stake. 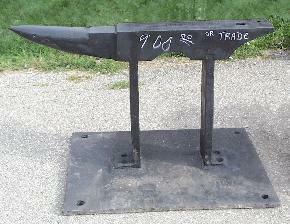 Stake anvils are relatively rare (there were 4 or 5 at Quad State) but affordable. 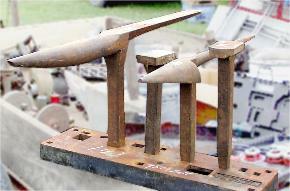 For light sheet metal work they were replaced by beakhorn stakes such as below. Large beak horn stake, square flat stake, blow horn stake, flat heel stake. See Page 2 for another set of stakes.